Listen to any Ramones record to get an idea of how good this guitar sounds. It's also VERY lightweight. 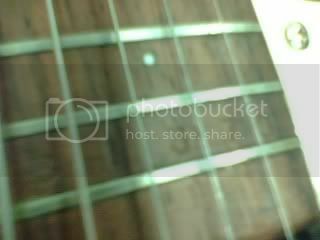 The neck is skinny and narrow and the frets are almost non-existant. The headstock has a good-sized volute but uses the Gibson 3-on-a-side fan style which I have heard hurts tuning stability. 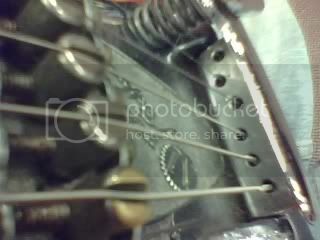 It went out on me once or twice but the strings were installed poorly so that might have been the cause. I don't know whether the pickups were humbuckings or very large singles. They had no visible polepieces, just flat black coverings. Not much hum...it fed back a lot but I was sitting right in front of the amp. Guitar Center wanted something like $2800 for it - it's probably cheaper online but still, at best, it's an expensive guitar. If I were ever going to spend that much on an instrument, though, I think I'd wind up with one of these. That is the original bridge piece from Ventures Mk II model, they came that way, the guitar has limited intonation, so they used offset holes to compensate. I have owned two originals. Due to the popularity of the Ramones, the guitar is way overpriced for what you are getting. When new in 1965, they were around $250.00, with case. Even now, without the Ramones angle, it's still a $250.00 guitar. Tiny frets, two rather tame black covered single coils, closer to P-90's than single, old style kluson tuners, rather strange and ineffective Vibrato based on a bigsby style. The new reissue Ramones guitars have one mini hummer and one single coil. They were Mosrites "student" model, or for those that couldn't afford the big brother. Think Strat vs. Mustang. My first original was stolen, the second resides in Brisbane, Australia in the Mosrite collection of Tym, From Tym's guitars. It is a blue one, with maple neck, rose fretboard, serial I believe O146. There were only about 150 originals made, they sold so poorly that they got discontinued fairly quickly. edited to add: the MkII and Mk V are distinctively different takes on the same model. The II is a slabboard body with minimal cosmetics, the V is a slight german carve with larger pickup enclosures and more resembling the MK I Mosrite which is the iconic model. 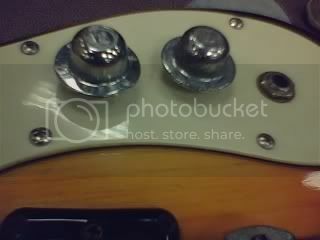 It had the "Crooked Neck pickup design, while the MKII had straight mounted pickups. Both are and were entry level Mosrites that Semie was so disappointed with that they didn't run long. As research has been made into their pasts, those models were shipped and sold in markets that were far away from California, then the hottest Mosrite market. Most were shipped to Texas, Olkahoma, and Kansas where they were sold in smaller shops instead of featured with their more expensive and better known cousin the MK I.
I bought both of mine at Arnold and Morgan Music in Garland Texas in 1965 and again in 1967. Is my guitar too loud? Too bad! I had a Mosrite bass for many years. Cool and funky with lots of unique parts. In the 60s the frets for Mosrite guitars were filed down to a small size. They are about the same as a Gibson Fretless Wonder except Mosrite rounded off their frets while Gibson didn't. The frets were designed for use with light gauge strings which I think were uncommon in the 60s. This would account for Mosrite's own brand of strings. Also, I do believe their tremolos are quite usable when set up properly. The ones on the Mark II models probably aren't but that was a cheaper trem. And now, For my opinion. I'd like to try the Mosrite guitar you played. It is in a Guitar Center in Virginia, Right? It would be about eight hours of a drive one way for me though so I don't think I'm going to go any time soon. The pickups are overwound single coils, If you're wondering. Also, Guitar Center WAS asking too much for it. The last ones I saw on eBay that sold went for about $1600 each. By the way, I don't think listening to "Any Ramones record" Is a good way to describe a Mosrite guitar's sound. Distorted, Sure but that was the Mark II model and Johnny even put different pickups in his white one and recorded with it. If you want better examples of a Mosrite's sound you could listen to some Ventures live albums or even one of The B-52's first two albums. They didn't call Mosrite guitars "The Ventures models" For nothing. Everything 101 Volts said. Playing a Mosrite is a different experience. It takes "getting used to" with their narrow, slender necks and "speed frets". Once you get the feel, they are a wonderful thing. And those pickups, especially the style used on The Ventures model (the Mark 1) are like nothing else. They are not P-90s like so many claim. They have a distinctive midrangy twang. It's hard to describe. You just have to hear it. They're great for rockabilly, country and funk too, not just surf or Ramones style punk.